Fast forward to current day, the Holy Spirit brought about events for the reformation of Master's Touch, with original member Andrew Shearer, being joined by Bro. Jeff Jones and Bro. James Brown. Although, comprised of new members, our desire and purpose are firmly aligned with that of the original group members. Above all, we want to be led by, and obedient to the Holy Spirit to minister in song everywhere we can. Lifting up the name of Jesus, ensuring that He receives all the praise, honor, and glory, of which He so rightly deserves. 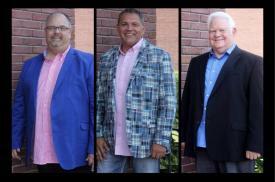 We are a Southern Gospel trio from Guntersville in North Alabama. We enjoy, and perform a variety of songs, with some of our strongest influences being, The Original Hinsons, The Happy Goodmans, The Rambos and many other wonderful groups from that time period. We also enjoy many of today's great groups, such as The Crabb Family, Gaither Vocal Band and too many more to attempt to name here.